If it's of any help, the print I saw theatrically in the UK (probably London) in May 1987 definitely had English dialogue - I noted it down at the time, commenting on the obvious English dubbing even of Granger for some lines, though unfortunately I didn't record if the print had any title other than Senso. Judging from the comments I noted about the colour, it must have been quite vivid, but I don't know what kind of print it was. The first time I saw the Italian version was on the BBC's Film Club a few years later, introduced by John Francis Lane who apologised for the quality of the print with burned-in subs, though it was actually a bit better than the UK video issue a decade or so later! David, I've got to track down Elaine Mancini's excellent resource on Visconti to provide some specifics on "Livia" for you; that may take a few days. I'm also hoping to unearth the VHS I mentioned to fashion some screencaps of the title cards. No guarantee it will even play in the machine but, if i find it, I'll try my best. 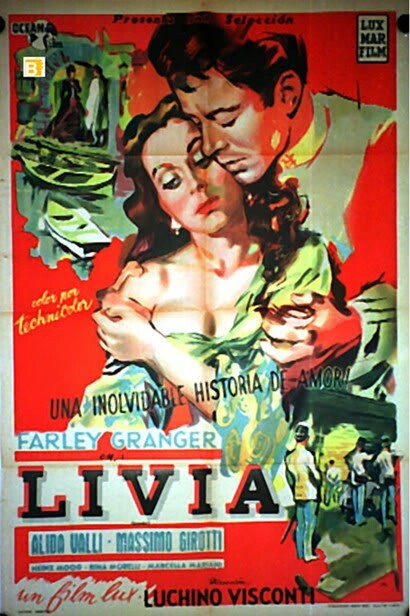 Until then, here's a jpg of an original "Livia" one-sheet, Argentinian to be specific (likely a Spanish-language print). Doesn't have a date on it, that I can see, but looks similar to the 1954 promo art, so probably close to, if not actually from, that year (the seller says it is). they say that the English-language prints they saw had the title "The Wanton Countess" on them, and not something else, even "Senso"? I'm curious, as I haven't been able to find any evidence (posters, reviews, newspaper ads, etc.) of the title existing before 1968, and then only as a distributed-to-TV entity (Granger's autobiography; a 1968 review by Andrew Sarris in "The Village Voice"; some promotional material). Even the HFA print has the title "Senso" on it (the one in the Criterion set). And, as I said, the video I saw was packaged as "TWC", but surprisingly had the title "Livia" on screen. This is interesting; I had figured the title (such a lousy one) was dreamed up mainly to appeal to a TV soap-opera viewing crowd. Last edited by Fred Holywell on Sat May 26, 2018 11:58 pm, edited 2 times in total. It is extremely difficult to arrive at any final conclusion about a work like Senso (Archway) after only one viewing. In the first place Senso is not an easy film to grasp... ...The version shown in this country [UK], however (under the title The Wanton Countess), adds immeasurably to the difficulties of a fair consideration of the film. The dubbing is terrible; and even in the scenes which were shot in English specially for this version, half the dialogue is unintelligible. Even before the film reached this country, the Italian censor had insisted on alterations in the script and the removal of several scenes. Since then there have been further extensive cuts, amounting to some minutes' running time, and as inexplicable as they seem unjustified. Inevitably the structure of the film has been irreparably damaged; and the movement is jerky and often apparently inconsequential. According to Geoffrey Nowell-Smith in the filmography appended to his LUCHINO VISCONTI (BFI) book, 'a print of the English language version is preserved in the [BFI] National Film Archive in London. The film was released in Britain in a shortened English-language version (91 minutes) under the title THE WANTON COUNTESS.' He has SENSO running at 121 minutes..
Curiouser and curiouser - that poster for the (supposedly English language) Livia is in Italian. Was Livia an alternative release title for Senso in more than one language / market? Many thanks, ellipsis, that "Sight & Sound" review certainly confirms "TWC" as existing before 1968. Very much appreciated. it's in Spanish, not Italian (except "un film lux"): "Una Inolvidable Historia de Amor!" ("An Unforgettable Story of Love!") and "color por technicolor" ("color by technicolor"). No indication it's an English-language version -- I'd figure it's Spanish dubbed. zedz wrote: Curiouser and curiouser - that poster for the (supposedly English language) Livia is in Italian. Was Livia an alternative release title for Senso in more than one language / market? the poster is in Spanish as Ellipsis points out. I have a strong feeling "Livia" is indeed a retitling of Senso/TWC for the Spanish language markets. No more or less. And tt almost certainly wasn't an English language dub, but most likely a SPanish dub . It seems also positive that TWC circulated in the US, UK and Oz from 1957 as evidenced by the BBFC censor info, and those original prints were almost certainly IB Techni (although not necessarily from the three strip Italian O-negs. By the late 60s it's almost certain original screening rights in English langiuage territories for TWC had expired and any subsequent print runs of TWC were done in Eastman from faded and probably dupe IPs. EDIT: Fred I also checked back on Farley's autobiog (a helluva good read: while he is fascinating in the Senso chapter, particularly on Alida's refusal to talk to him off the set, and the difficulty they had doing their scenes together, he is definitely on the wrong track with TWC as a late 60s enterprise. It looks like the original rights for TWC (Lux? Titanus)t expired and a West Coast copyright speculator took it over, including the rubbishy Eastman reprinting. the poster is in Spanish as Ellipsis points out. (cough, cough) That was I with the handy-dandy Spanish translation. I wouldn't mention it, but all those years of Spanish-language courses had to be good for something. It looks like the original rights for TWC (Lux? Titanus) expired and a West Coast copyright speculator took it over, including the rubbishy Eastman reprinting. It was Lux, and that makes much good sense, David. For the curious and/or completist, here's part of the West Coast distributor's ad. To complicate matters, they date the film as 1964 and offer a running time of 110 minutes! I, for one, am not even going to consider that for fear of wading deeper into the intercontinental movie morass. he is definitely on the wrong track with TWC as a late 60s enterprise. Luchino Visconti's "Senso" had never really been released in America before, but now the Elgin Theatre (at Eighth Avenue and 19th Street) has unveiled a version Visconti himself has approved. Sharp-eyed televiewers may have caught an abridged version of "Senso" under the lurid title of "The Wanton Countess," a tale all too typical of Visconti's films in America. Looks pretty good. Saw the 1993 or so restoration projected the other month and the Criterion seemed to match it, and this doesn't appear far enough. 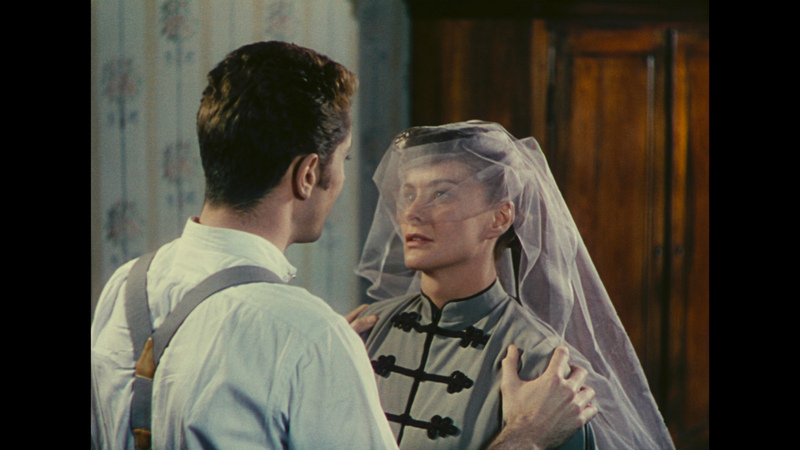 A milky, white-leaning color palette affects the whole film. Another Ritrovata'ed color grading. It doesn't seem too bad, but some shots still give it away (like at 1:06, and a sky that reminds me of their work on the King Hu's movies). But this is just a Youtube trailer. It's probably going to be like the Hulots, where their color default color grading isn't too far off from the actual unique color timing of originals. Just a thought. Interesting, whites are milky and off kilter in one shot, then clean in the next shot. Some of it looks very good.Nice depth to the image where the current hd looks thin and pushed. Who did the 4k for Canal? Not too different from my memories of watching the Criterion blu-ray. What makes this a new restoration then? It might just be the 2009 restoration touring again, since it was already made through the Film Foundation by L'immagine Ritrovata. I have no idea who did the previous Studio Canal restoration, but seeing how the Criterion one has SC in the technical credits ("Film restoration: Studio Canal, Centro Sperimentale di Cinematografia/Cineteca Nazionale, Cineteca di Bologna/L'Immagine Ritrovata. With funding provided by Gucci, the Film Foundation, and Comitato Italia 150. "), and how the 2 discs seem to share the same basis and to be mostly (only ?) set apart by the color timing, it might be actually the same restoration used for both, but re-graded by Canal for their release. This is a new restoration. When they played it on 35mm in the Visconti retro over the summer, they announced they had attempted to debut the new resto as part of the series but were denied because it would make its premiere elsewhwre. Even allowing for it as a trailer, the image appears to have far better gamma and “depth” than the 2009 version.